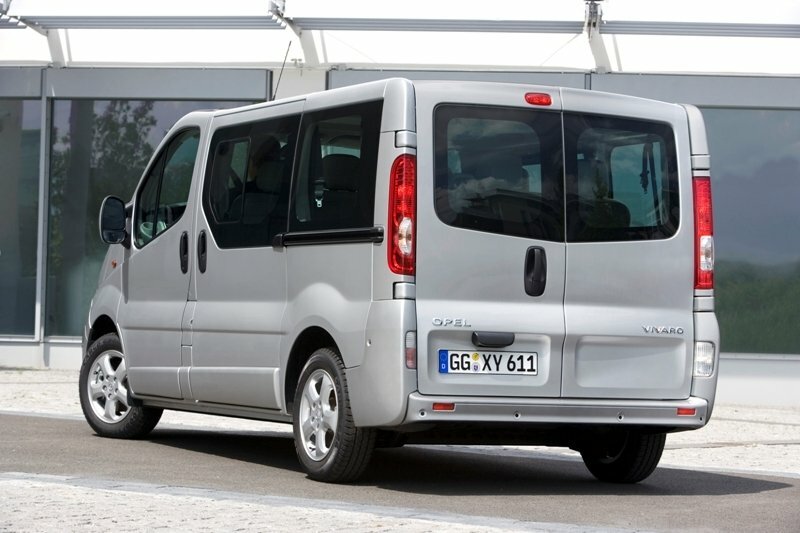 The Opel Vivaro was launched in 2000 at the same time with its twins from Renault and Nissan. With an innovative style the Opel Vivaro was far ahead of its times and its wicked style survived pretty well for over ten years. 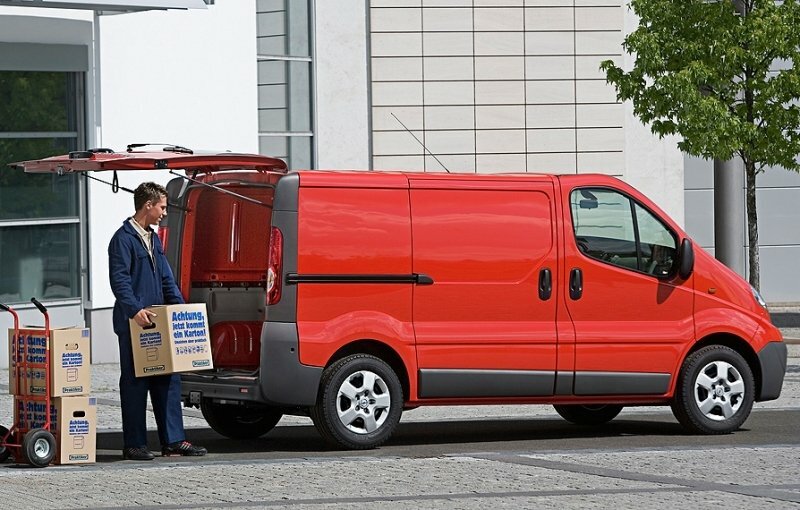 The Vivaro is positioned just below the Movano in the Vauxhall’s commercial hierarchy and is aimed mainly against models like The Ford Transit or Volkswagen Transporter. 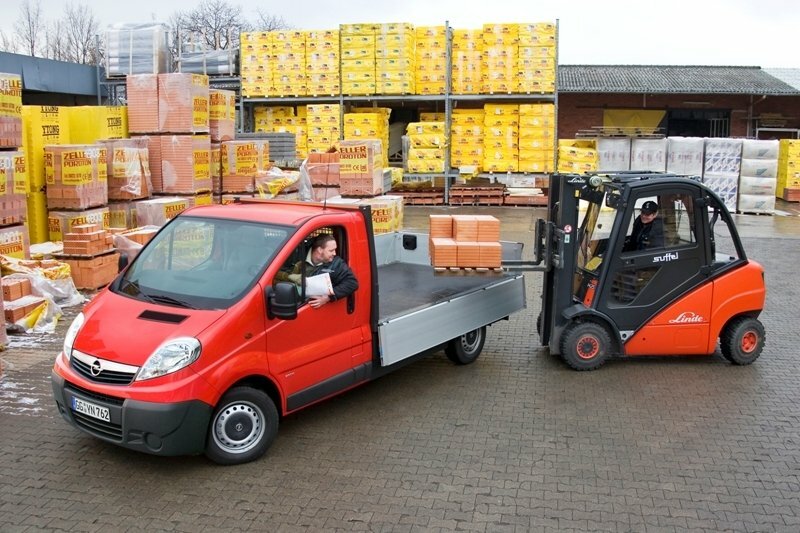 The vehicle is available as a panel van, passenger carrier and chassis cab and comes with both short and long wheelbases. The Opel Vivaro has a starting price of $25000 and is powered by a range of 2.0 and 2.5 liter diesels or a 2.0 liter petrol unit. Ever heard the saying "If it ain’t broke, don’t fix it"? Well, this is exactly what Opel did here, as since its first launch the Vivaro didn’t receive any major exterior facelifts and besides some small refreshes the body remained mostly the same as in its first day of birth. Everyone liked the Vivaro’s style as it brought something new on the dull boxy segment of light commercial vehicles. When designing its Vivaro (and Traffic and Primastar) the company’s engineers thrown into mix a lot of dynamic lines combined with a bold and purposeful stance. The result is a design that lasted without aging for over 10 years and some consider that it may last even longer. The front end features a tasty curved grille flanked by two almond-shaped shaped headlights with integrated turn indicators. The bumper has a basic design, but the despite its simple shape it gels well with the rest of the vehicle and it can also be fitted with a pair of round fog lamps. The dynamic design is also enhanced by the raked bonnet and the heavy angled windshield. The profile view of the Opel Vivaro shows the sporty sloped bottom line of the lateral windows and the accented side swage lines combined with pronounced wheelarches. The load area has a box body for optimal loading while protective moldings on the bottom of the doors prevent minor scratches. For maximum practicality the back bumper can be also used as a step into the cargo area. The stylish exterior design is matched by a pretty nice interior with a car-like feel. It’s true that is not the most attractive cabin in the segment, as we find its dash a bit cluttered, but it’s nothing inherently wrong with it either. The good part is that the interior is pretty flexible with a lot of storage places and every detail was designed with functionality in mind. The plastics aren’t part of the Mercedes Vito league, but they are easy to clean and look durable. The build quality is also satisfactory, while the NVH (noise vibration harshness) levels are also kept to a satisfactory level. Despite the relatively clattered dash, all the controls are placed within easy reach and we also love the dash mounted gear knob as it falls easy into hand and offers a good grab. 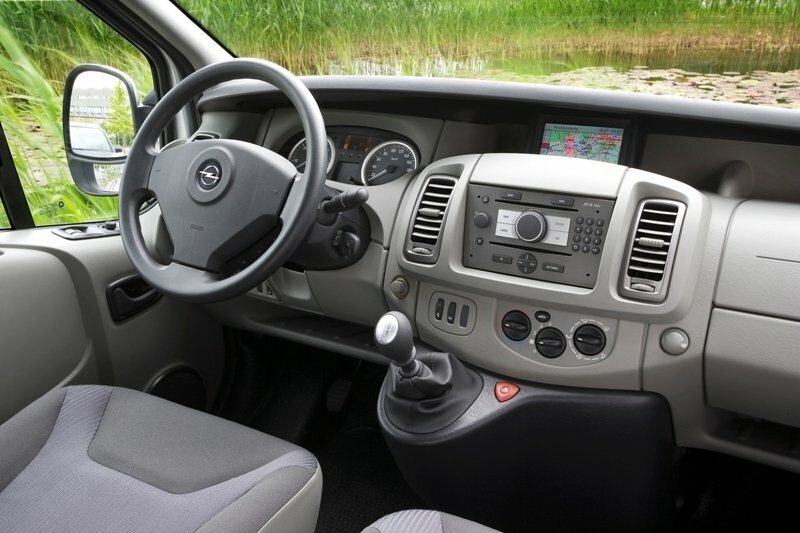 The Opel Vivaro offers room for three passengers at the front, but the middle passenger could feel a bit cramped as it lacks proper shoulder and legroom. Luckily the driver’s seat offers plenty of leg-, shoulder- and head room, and is also available with a wide range of useful adjustments designed to permit you to get cozy pretty fast. For enhanced comfort the four spoke steering wheel can also be adjusted for both reach and rake. Needless to say that the all-round visibility is top notch and the plate sized door mirrors are also up to the task and keep you well informed in any situation. The Opel Vivaro comes with a host of features which will make your life on board easier. Among them there is a TomTom navigation system, radio CD/mp3, air conditioned glove box, electric windows, trip computer and remote control locking. There Opel Vivaro is available with a choice of five four-cylinder engines including four common-rail turbo-diesels with 2.0 and 2.5-liter displacements, and a 2.0-liter 16V gasoline unit. All engines come with a six-speed manual transmission as standard, while the 2.0 CDTI with 114 hp and the 2.5 CDTI with 146 hp are optionally available with the automated Easytronic six-speed manual gearbox. 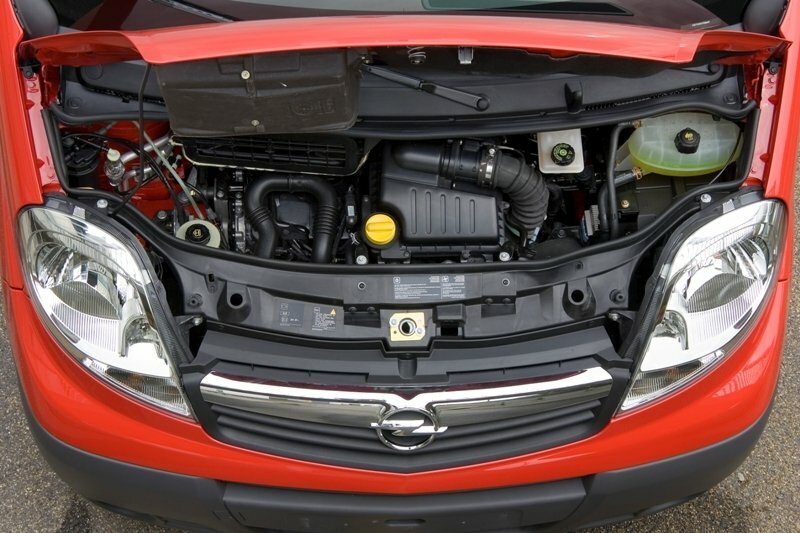 The weakest engine in the Vivaro lineup develops 90 hp and offers a maxim torque of 240 Nm. However, despite having the smallest output in the lineup, the engine is still able to offer good performances and scores a top speed of up to 145 kmph. The 2.0 CDTI unit is slightly stronger and develops 114 hp and 290 of torque, whereas the top speed is rated at 160km/h. The 2.5 liter CDTI occupies the top position in Vivaro’s engine pack and is available with two power outputs of 146 hp or 114 hp. Both come with a maintenance-free diesel particulate filter as standard. The 146 hp unit offers 320 Nm of torque and can hit a top speed of 170kmph. The Opel Vivaro Chassis features McPherson independent front-wheel suspension and rear torsion crank axle. Thanks to this suspension configuration the Vivaro offers one of the best ride and handling compromises available in the segment and soaks the road bumps with ease while also maintain a good overall balance. The direct steering and car like stance with minimal body roll means that this vehicle can deal pretty well with corners too. It’s true that the low speed ride is a bit stiff, but even then it isn’t really bad and it gets better as the speeds increase. The stopping power is at par with competition and the Vivaro gets disk brakes all around, brake assist and a four-channel Anti-lock Braking System (ABS) with Electronic Brake Force Distribution (EBD). For enhanced safety the vehicle is also offered the optional Electronic Stability Program ESPPlus. Despite its age, the Opel Vivaro is still able to make a compelling case for itself. Its design is still an eye catcher even when judging by today’s standards and the engine lineup consists of strong and efficient engines which cope great with the utilitarian nature of the vehicle. The Vivaro is easy to drive and offers a comfortable ride combined with a responsive steering and sharp brakes. On the other hand, the cabin is starting to show its age and could’ve come with more comfort. However, the Vivaro’s position is threatened by new models like the recently revealed Ford Transit Custom which brings in a more upscale cabin, a futuristic design and more efficient engines. Hence Opel has to come up with a major upgrade if it wants to keep its good reputation.